Robin & I have been in Laos for a while… we spent 2 days in Vientiane, 3 in Vang Vieng, and today we’re heading to Luang Prabang. The journey here was good. We took the sleeper train to Nong Khai and then a short connecting train over the Thai/Lao border. This train is neat: they close the Friendship Bridge to car traffic and run the train straight down the middle. It stops in the Vientiane suburbs at Thanaleng, so we shared a van with some other climbers we met at the train station into town. The country is very laid back and friendly. It’s also noticeably poorer than Thailand, even in the areas that see a lot of tourist spending. Vientiane is a nice place to spend a few days or even longer. The food is great, mostly thanks to French colonial influences. There’s lots of good, real cheese, the coffee is usually excellent, and fresh baguettes are everywhere. Actually, this goes for Vang Vieng as well. I’ve had excellent bacon at least once a day here :) They also serve the favourites from Thai cuisine and a few local dishes. I also made it to the Buddha Park, the morning after my failed attempt to reach it by bike. 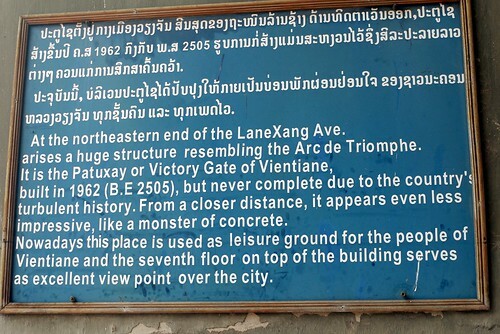 It’s pretty cool – there are several concrete safety hazards sculptures that you can climb, including a reclining Buddha that’s become a local object of worship. Unfortunately, I was too early for monks to be climbing the Buddha. And then there’s tubing. The basic idea is to rent a tractor inner tube, take a tuktuk a few kilometres up the Nam Song (river), and ride the gentle currents down. The real attraction is that there are many bars along the banks of the river selling beer, buckets, and "happy" things. It’s basically spring break with tubes. Fortunately, there’s also climbing here. It’s not as well developed as in Tonsai, and I wouldn’t recommend visiting without a partner (unless you’re willing to hire a guide), but you can rent ropes and a few crags are bolted. I climbed with Robin for a day, then climbed with some people we met on our way. It’s about the same kind of climbing as Tonsai: heavily pocked and featureful limestone. The routes are dirtier because they’re climbed less, but on the upside they’re a lot less crowded and it’s about 10°C cooler at this time of year. I managed my first 6c lead (it was short and well protected) but I stopped about halfway up the 6c+ that shared the top anchor because the top holds were full of spiderwebs. One of the cool things about the crags here is that they’re actually in the jungle, so you get the things you’d expect: big spiders, huge anthills, seed pods the size of your fist, weird spikey vines, and dense vegetation anywhere off the trail. No weird animals; it’s still too close to civilization. There are goats and ducks living near one crag though. And now: onto Luang Prabang, then we’re flying to Chiang Mai on Lao Airlines. …and I’m not even bored! Many years ago, I found a text file of "things to do when you’re bored", one of which was "Make up a language and ask people for directions in it." I got a taste of how that might go today. Robin and I decided to visit the Buddha Park, which is apparently a quirky ferro-concrete tourist attraction built in the 60s. It’s in Tha Deua, 27km from Laos, so the cheapest sensible way to get there is by bus. The bus station is 2km from the city centre, so we rented bikes for the day and I bought a map. By the time we reached the bus station, I had decided I’d like to ride to the park, so I set off. The first half (or so) of the ride was uneventful. Traffic in Laos is slow, patient, and used to dealing with slower 2-wheeled vehicles since some of the locals ride bikes and many more ride motos. Then I reached a fork in the road, labeled only with the names of a few temples that were not on my map. The fork also wasn’t on my map, but neither was a roundabout a few km back (which was labeled with Tha Deua so OK.) I took the paved side of the fork, and the paved side of another fork a few km later. It was a pleasant ride, and definitely off the beaten track. I was the only white person in sight. People waved from streetside shops and restaurants and yelled "hello!" I saw people of all ages riding motos and bicycles, including school children and monks. There were many schools and temples along the road, the only structures that didn’t appear grey and run down. I was beginning to worry if I was going the right way, so I asked a man at a roadside shop for directions to Tha Deua or the Friendship Bridge (to Thailand, on the way to Tha Deua.) He was completely unable to understand what I meant, and the same held for everyone else I asked. I rode along the road some more but without much hope – I had ridden far enough that I definitely should have reached the Friendship Bridge by now if not Tha Deua. When the pavement ran out, I turned around. Shortly thereafter, a 12 year old on a Honda Wave pulled alongside me and asked "where you going?" I again tried to ask for directions to Tha Deua or the Friendship Bridge but he only looked at me blankly and said "sorry." He rode alongside a bit longer, then said goodbye and pulled away. On the way back, I stopped at a stand selling pressed sugarcane. This is a green/yellow drink served in a bag of ice with a straw, produced by running sugarcane pieces through a motor-driven press. It has a strange taste that I didn’t really like, as well as being very sweet (instant sugar rush, moreso than I’ve had with any cola or sports drink.) It was worth a try though, especially since it cost me the equivalent of 25¢. So oh well. Robin phoned me from the park, wondering where I was. We’re meeting up at the guesthouse when she gets back, and if she recommends seeing the park, I’ll take the bus out there early tomorrow. If not, it was still a fun ride so no loss! Robin and I are now on a train to Nong Khai, just across the border from the Lao capital Vientiane. After Tonsai I took a longtail boat to Ao Nang (the closest community with a road), a minivan to Surat Thani train station (actually in the neighbouring town of Phunphin), and a train to Bangkok. There I met up with Robin, who left Tonsai before me since she was tired of climbing. In Bangkok, we did some tshirt shopping (it’s a little known fact that Bangkok is one of the tshirt capitals of the world), visited the Reclining Buddha, and Robin visited the Grand Palace (I’d already been.) We also got to hang out with Julie, who’s been living in Thailand for a few years now. It was a short visit though – our Thai visas run out today. So onto Laos, where we hope to visit Vientiane, Vang Vieng, and Louang Prabang before heading back to Thailand to visit the north and see more of Bangkok! Like I said, Tonsai is a great place! There’s a friendly community, mostly made up of climbers. The population is small (probably under 100 permanent, 400 transient at this time of year) and it’s almost completely isolated at night because the hike from Railay becomes significantly more difficult and dangerous even with a flashlight, and longtail boats don’t run. There are about 25 longtail boats based in Tonsai. Other vehicles include: 3 pickup trucks, about 6 motorcycles with cargo beds, and about 10 regular motorcycles. The longtail boats are moored with old climbing ropes, of course. After climbing, Tonsai has a decent nightlife. It’s not a spring break-style party like you’ll find on other beaches, and there’s almost no dancing. It’s mostly people sitting around and talking, and an occasional live band – which is more my scene anyway. A couple of hints of Burning Man are around: there are generators everywhere at night, random bars with random decorations (though they charge for drinks), and firespinners! Some of the resident climbers have taken up firespinning in the evenings, and they’re really good. There are also slackliners, and one guy (at least) who combines both! The food in Tonsai is great! The cheapest places to eat are the most popular. These are the "chicken ladies", two restaurants based out of shacks on opposite sides of the main road. They have big communal tables where people are (as usual) happy to talk to strangers. The most common morning food is sticky rice with mango (and there’s a recipe in the climbing guidebook for when you get home.) The most common morning greeting is "are you climbing today?" Everyone lives in a hut: maybe with power, maybe with running water. Nobody complains. Everyone just wants to climb! After my climbing day with Mia, Robin took her course in lead climbing and I headed out for a day of deepwater soloing. As far as I know, DWS is unique to the area. The idea is simple: instead of using ropes to break your fall (free climbing), or climbing close enough to the ground that you won’t injure yourself if you fall (bouldering), you climb with clear, deep water below you. This trip was organized by Basecamp Tonsai and they did a great job. We had a longtail boat to take us to the cliffs, which were near Chicken Island. We climbed at one spot in the morning, ate lunch on the beach at Chicken Island, then climbed at a different spot in the afternoon. The details were well thought out. They had a kayak to ferry you between the longtail and the cliff, both because longtails aren’t very manuverable and to prevent climbers from falling into the longtail (ouch!) Some climbs were equipped with ladders to make getting out of the kayak easier, and some were equipped with chalk bags at the start. In the morning, I only climbed the intro route, which was a grade 5 traverse followed by a 6a diagonal to a ledge 10m above the water. (10m is considered safe – you can hit the water any way without injury.) One of the guys climbed a 7a to 20m up, which was impressive to watch! In the afternoon, I managed a 6a traverse on my second try, and got up all but the last move of a 6b stalactite. (Signs you’re among climbers: the Thai guide who speaks about 300 words of English knows the word "stalactite.") I wasn’t climbing as well as usual. Mostly, I found it inconvenient to climb while wet without much chalk. Oh well, it was fun. All in all, it was a great day. Between climbs, I got in some swimming and snorkeling, chatted with climbers, and watched some great climbing. At one point in the afternoon, one of the boatmen climbed most of a ridiculous crack (grade 8c if memory serves), fell off, then spent about 15 minutes traversing all over the face. An amazing climber! So if you’re a climber travelling in Thailand, head out on a Basecamp Tonsai Deepwater Solo trip! I think it’s best to do it as your last day in Railay/Tonsai though, so you have more time to get used to the local rock and build some strength. I took a lot of photos. I’ve been giving out cards with my website, and I want to give everyone a few photos of themselves climbing if I can. So check out the highlights or the full set of 60 photos. So far, Tonsai is a tropical paradise. It has 1 high end resort, about 6 cheap resorts (like the one we’re using), a handful of mini marts and restaurants, about 10 bars, and 6 climbing shops (offering sales, rentals, and guiding.) It also has cats, cats everywhere: both strays and pets, tame and skittish. The place is technically part of the Thai mainland but it feels like an island because the only way in or out is by boat. It’s also (as I noted yesterday) isolated even from Railay – it’s difficult to walk there at high tide, and dangerous at night. Power is from generators and Internet is by satellite. Prices for everything are about double the prices in Krabi or Bangkok. Yesterday, Robin and I finally made it climbing. After checking out most of the climbing shops, we settled on Basecamp Tonsai, which is the biggest and seems to be the best. They’re pretty much in the middle of Tonsai and they’re pretty much climber central – as well as the shop, there’s a shaded deck where you can chill, meet other climbers (although any restaurant or bar is also good for that), write notes on the whiteboard, and so on. We joined a guided tour for the day – I wanted to get a feel for the area, and Robin wanted some top roping before jumping into lead climbing. (Most routes here are sport lead, in other words you climb from the ground clipping your rope into bolts along the way. With a guide, the guide does the leading then leaves the rope in place so you can top rope, which is safer and easier.) It was a great day! We climbed a few routes of varying difficulty in the morning, then headed up through a cave, rapelled down from the cave’s upper entrance, and climbed some more! The guide, Tong, was excellent, and there were two other climbers: a buff German guy trying the sport for the first time, and a girl from BC who climbs at about my level. The rock here is excellent. I can see why people come here from all over the world just to climb. It’s limestone, but it’s nothing like the limestone in Kingston, Ontario. This stuff is pocked with holes of all sizes, covered in stalactites, and generally full of places to put your hands and feet. The downside is the rock is sometimes sharp on your hands (and rope!) A lot of the cliffs (especially on Tonsai) are also overhanging, which makes climbing harder. Railey has a good selection of mostly-vertical stuff so people head there for easier climbing.. Tomorrow, I’m meeting up with the girl (Mia), and we’re going to rent some gear and head out on our own. Robin is going to do a 1 day outdoor leading course. Or that’s the hope anyway. Robin and I both got sick today with an ailment the locals call Tonsai Tummy :( Robin hasn’t left the hut all day, and I just left to buy food and drinks. We’ll be OK eventually though, and today was going to be a rest day anyway – I haven’t climbed routes since Christmas so I need to recover from yesterday. We’re now in a bungalow in Tonsai beach. Getting here was quite the adventure. After our "donkey" (Malaysian train) ride to Wakaf Bahru, we spent the night in Khota Bharu. The guidebook was right – Khota Bahru accomodation is filthy (regardless of price.) But we found a place where the bed at least was clean and free of bedbugs to spend the night. The next morning, we took a local bus to the Thai border and crossed over to Sungai Kolok. A nasty surprise at the border: they’re only giving out 15-day entry stamps when you cross by land, not the 30 days we were promised by our guidebook (and still available when entering by air.) So our plans will have to change… oh well, they were only plans. From Sungai Kolok, we took a second class Thai train to Hat Yai. I’ve been on a third class Thai train and the only difference is hard vs. soft seats – still no aircon, but that’s fine. The cars were white steel on the outside, mango orange-painted wood on the inside, so I declared the train to be a mango. Overall the mango was much older than the donkey, but better maintainted. It was about 5 hours to Hat Yai, then a tuktuk ride took us to the bus station. Most of the buses were actually minibuses going to all sorts of places, but Krabi is on the way to Phuket, which is a big enough destination to merit a big bus. And what a bus it was! This bus was, in fact, a kitten. A pink kitten. I decided this because it had beckoning cat air fresheners inside. It was a double decker with seats on top and a padded floor below holding baggage, someone’s new motor scooter, and overflow passengers. Overall, the nicest bus I’ve ever taken, especially since it had aircon. Other features included DVDs of Thai music videos on screen during the 5 hour ride and a green fluorescent tube in the engine compartment – definite style points. On a rest stop, I watched the shiny Mercedes engine for a while and noticed that they were carrying several spare fan belts. Smart bus company! Once in Krabi, another adventure: at this time we were travelling with another backpacking couple we met in Sungai Kolok. The bus stop was in a remote area but we didn’t trust the aggressive man who met us right off the bus and told us it was 6 km to downtown and he would take us there for 200 baht (about half the cost of our 5 hour bus trip!) He would’t budge on the price, so we started walking. And walked, and walked. After well over 1km of walking, a moto driver stopped for us. These are drivers who will take you around town on the back of a motorcycle – very popular with the locals for short trips. He realized there was no way we could take motos with our heavy backpacks, and helpfully called some friends with a taxi. About 10 minutes later, the taxi (which was a pickup truck with passenger benches in the bed) showed up. We didn’t even try to haggle over the 200 baht price this driver also wanted. He took us to the hostel, no problem, and we paid through the passenger side window. The driver’s ~5 year old daughter actually took the money, held up by his wife. This was clearly a family business! All in all, it was a good lesson in 3rd world economics: sometimes you can bargain, but sometimes you just have to pay the 200 baht to get where you’re going. The hostel was called Good Dream – an oasis of sanity in this crazy country. The owner spoke excellent English and had a wide varitety of opinionated information on Krabi area attractions, with prices. The room was cheap and spotlessly clean. The breakfast was not the cheapest but it was excellent – the closest thing I’ve had to a trucker’s breakfast in over 2 months. Onwards from Krabi, we took a longtail boat to Railey Beach – 150 baht each. The boatman wanted 400 baht more to go to Ton Sai so we declined. Various sources said it was a 15 minute walk to Ton Sai Beach, which is the area with the most climbers and the cheapest accomodation (coincidence? I think not.) Various sources were wrong. There’s a 15 minute walk between the beaches that’s doable at low tide, but not with heavy backpacks because of slippery rocks, and anyway this was high tide. There’s a 30-45 minute overland walk which we tried to find, but on the way there we passed a couple of climbers who told us there was another way: a path near the low tide walk where you scramble up a steep hill and down the other side. It took us about 30 minutes to find the path though, and Robin couldn’t do it with her backpack so I had to do it 3 times, twice with a load! So, finally, Tonsai. I bought a big jug of water at the first bar on the beach and we drank most of it on the spot. Then we found a cheap but decent hut: it has a shower, electric lights, and a fan. Compared to my usual climbing trips where I’m camping, this hut is luxurious :) I think we’ll stay here for a while. "Enjoy the journey." That was a sign I tied to the back of my bike on part of my cross Canada trip as a response to all the RVers who seemed to hate the road and live for the rest stops and scenic outlooks. The jungle line was definitely a good way to do just that. From Gemas, we boarded another "donkey" (Malaysian train) and rode it all day. The scenery was amazing! Lush jungle on both sides, palm oil plantations, and then the mountains, which was lush jungle plus amazing rock outcroppings. We made it to Krabi amid many adventures. Tomorrow morning, longtail boat to Railey Beach for climbing. Robin and I arrived late on Friday night to find the public transit system already shut down, so we took a taxi to our hostel. The weather in Singapore is about a billion degrees and humid, like the rest of southeast Asia, and it somehow manages to feel a lot like a third world country: there are people selling junk on the street amid Lexuses and Mercedes. Things randomly don’t work (like ticketing for the local "rapid" transit, which is a giant pile of fail.) Everything seems to be either shoddy or owned by a megacorp. So from that point of view, it’s been a good experience: a place to get used to the heat, humidity, and general inconvenience of life in this part of the world without any actual danger to us or our property. And now we’re on a train that took us across the border to Malaysia and will hopefully take us to Gemas. At the station, yet another sign we’re not in Japan anymore: the train was over an hour late leaving Singapore, and now seems to be running an hour behind schedule. Welcome to the third world! I declared to Robin that this train is not a kitten (since kittens are of course the embodiment of awesome in the world.) She told me it was a donkey, and I’m inclined to agree. We’re hoping to spend the night in Gemas then get up early to taking the Jungle Line to Khota Bharu, which borders Thailand. From there, train, bus, then boat to Railay Beach and rock climbing! [*] Nothing in the first paragraph of this entry should be taken as fact. Obviously.